The most popular garden shed range is the gable roof range as they offer a large area for work or storage with the addition of the ridge beam forming an integral part of the construction and increasing strength and stability. 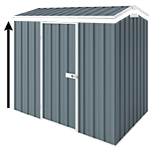 This size shed is ideal for garden or tool shed or used for the storage of bikes, toys and general gardening equipment. It comes with double hinged door (2 x 0.75m) at the front to provide you with easy access. Please check out the available accessories below to customize it to your needs. Shed comes with 20 years warranty.